When gamers get their hands on Total War: Three Kingdoms in a few weeks’ time, they’ll be able to choose between eleven different playable heroes in the game’s campaign. (The twelfth hero, Dong Zhuo, must be unlocked first.) 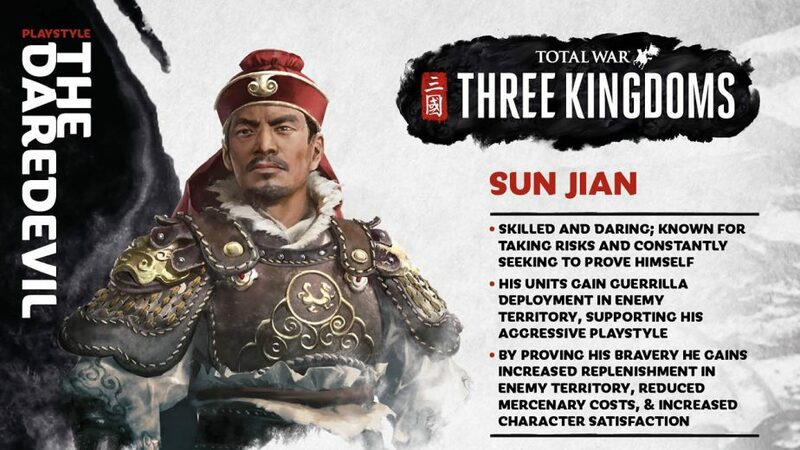 These Total War: Three Kingdoms heroes range from lesser-known figures like Kong Rong and Gongsun Zan to those whose actions defined the era; Cao Cao, Liu Bei, and of course, Sun Jian, the man whose son, Sun Quan, who would go on to establish the kingdom of Wu. Creative Assembly has already released a trailer for Sun Jian, the Tiger of Jiangdong, but now fans can read much more about this famous hero. Sun Jian begins play in Jiangling Commandery. However, this isn’t his starting territory, which is the neighbouring Changsha Commandery; players must guide his force through enemy territory and back to his homeland. Once he arrives, his first major dilemma concerns the Imperial Seal. Liu Biao will request it from you, and you must choose to either hand it over or refuse, which will make Liu Biao a foe. Although Sentinels are typically defensive, Sun Jian’s play-style leans more towards attack. The more he proves his bravery with frontline victories, the better his unit replenishment rate becomes while in enemy territory. He can also use this mechanic to recruit mercenaries at a cheaper price and improve the satisfaction of his other characters. Interestingly, all of his units use the guerrilla formation. This means that they can deploy into battle faster and potentially overcome their enemies before reinforcements can arrive. This can be a risky approach, however. As an added bonus, Sun Jian’s ports boost commerce income throughout his territories. Although the Sun family would go on to establish one of the ‘three kingdoms’ of the era, Sun Jian sadly did not live to see it. 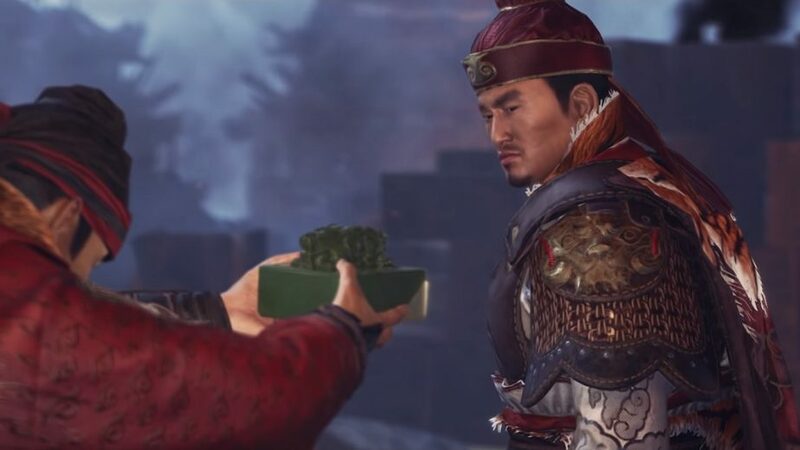 In fact, he was killed in 193; just three years after the start of the Total War: Three Kingdoms campaign; the stories say that Sun Jian was crushed by rocks while pursuing Lu Gong during a battle. His eldest son, Sun Ce, went on to succeed him. Although Sun Ce was a highly capable military leader, he was assassinated just seven years later. As a result, his younger brother Sun Quan became leader of the family. It was Sun Quan who would go on to found the kingdom of Wu, becoming its first emperor, and who became rivals with both Cao Cao and Liu Bei. Four of Sun Jian’s special abilities have been revealed so far. Creative Assembly has yet to provide exact details of what each does, however. The post Total War: Three Kingdoms Heroes – Sun Jian, the Tiger of Jiangdong appeared first on VGR.